Let’s face it. As a child I was a bit of a handful. 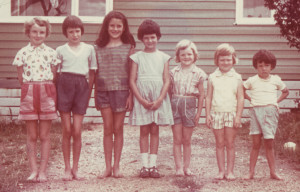 Yes, that’s me on the far right. I mean, just look at me. Is that the face, and body language, of a sweet young thing? I think not. But being a little wild served me well. I’d climb the tallest trees. Explore the darkest caves. Handle the ookiest animals. Brave the wildest oceans. Tell the biggest fibs. Imagine the most fantastical worlds. 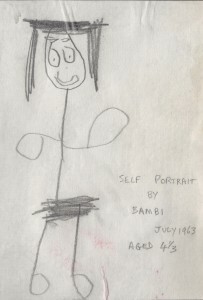 All of which would ultimately shape who I was to become later in life – author, artist, adventurer. And herein lies my tale…. As soon as I learned my ABC’s I started writing. Not that anyone could understand what I was getting at, but at least it was a start. 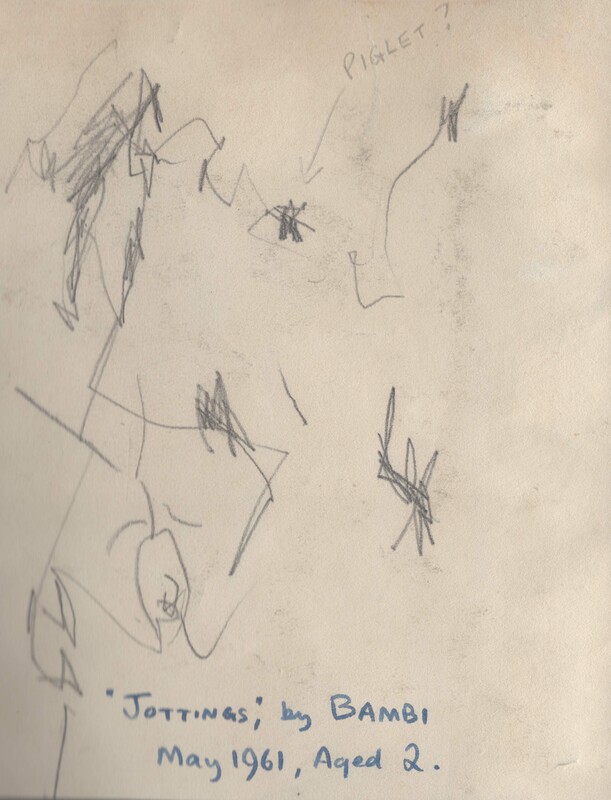 One of my first written pieces was a travel diary (below). I was 8 years old. 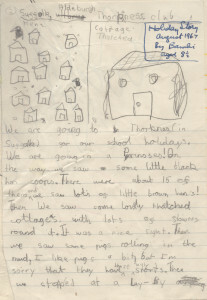 I do hope my writing has improved since then. 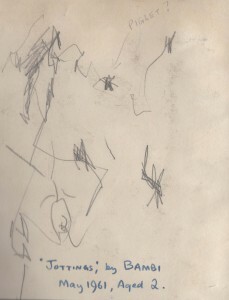 My first book was Cat’s Eyes. 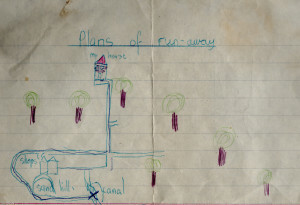 Written when I was 12 years old. A fast-paced sci-fi thriller, with plenty of blood and guts. It was never destined to grace the bookshelves, but it DID get me A++ in English. 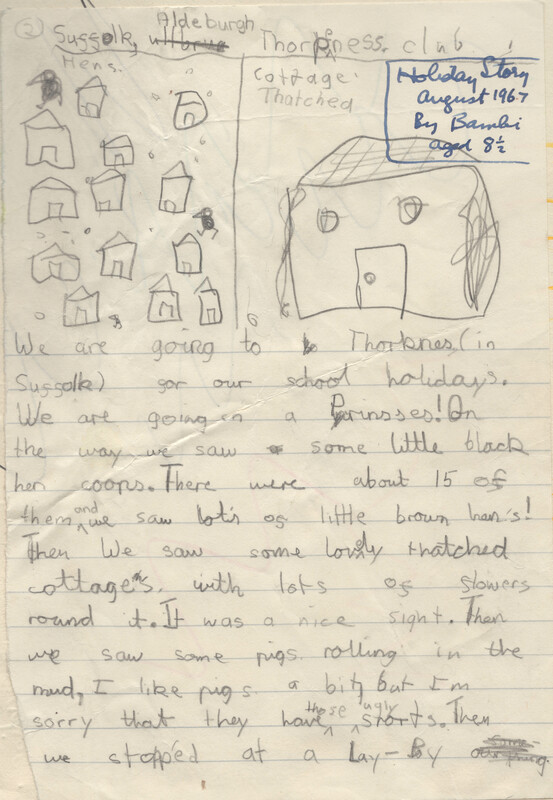 In later years I turned my hand to children’s books – mistakenly believing that was an easier genre than travel memoirs or thrillers – but at least I got published. 18 times in fact. I am now more interested in writing for adults, mostly autobiographical, having decided that truth is often stranger than fiction. 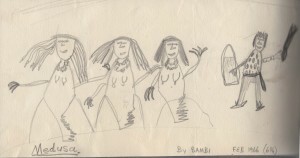 I have completed two books, to be published by The Five Mile Press – Men on the Menu, 2014, and Bad hair Year, 2015. I have another fiction novel in its final draft – The Eighth Deadly Sin, and another 2 autobiographical ideas up my sleeve. 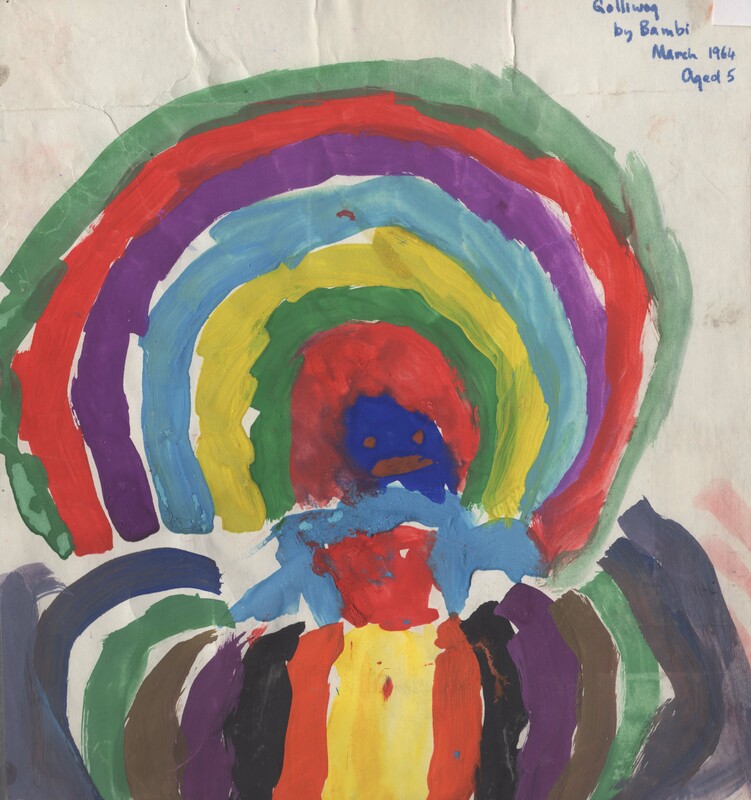 My first recorded artwork was completed when I was 2 years old. 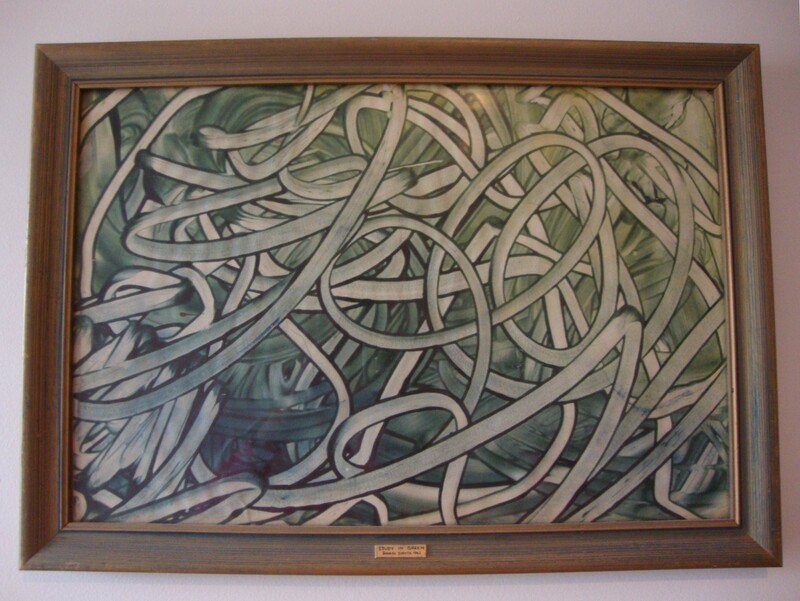 My father generously suggested that the central squiggle was actually… well… something. By 4 years old I had progressed (quite spectacularly) to portraiture. 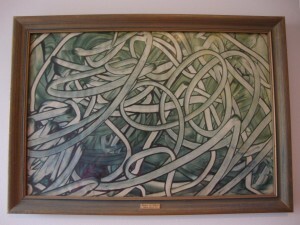 By 4 1/2 I was on to Abstract Impressionism. By six I was becoming more subtle with my palette. This finger painting won First Prize, and £2.00 in the 6-8 year old section of the local Art Show. My father generously entitled it Study in Green. Bless him. 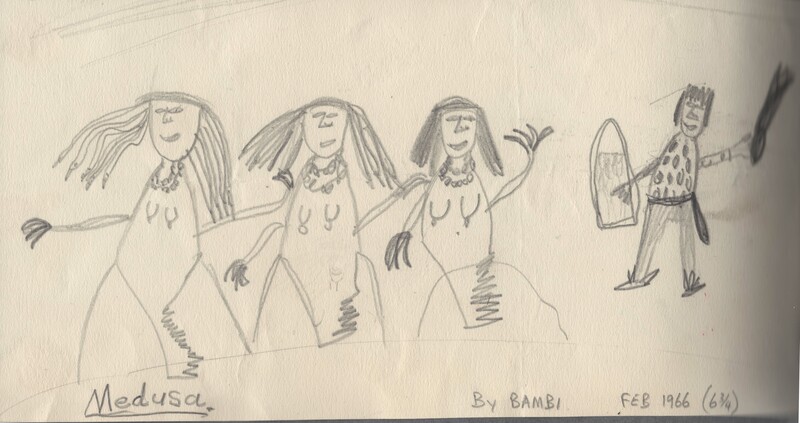 By 6 ¾ my art had developed some rather disturbing sexual themes. 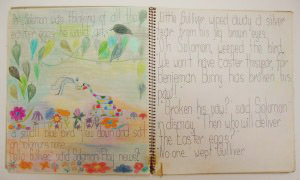 Things eventually settled down, and at 11 years old The Easter Snake was my first fully illustrated children’s book. Strangely enough, it was never published. 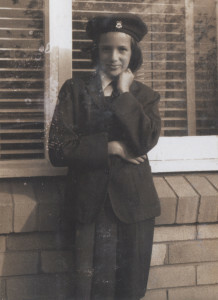 After school I completed a diploma in Design at Swinburne College (Melbourne), then free-lanced for many years – designing stationery, cryptic board games, 3-D jigsaws, sports and children’s clothing. I was also Creative Manager at Playgro (plush nursery toys) for 7 years. 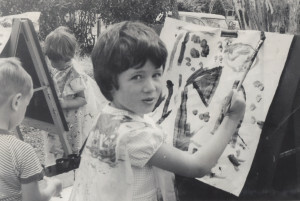 These jobs/projects were interspersed with running my own small business enterprises – producing boutique resort wear, designer crockery, resort maps, upmarket Australian wildlife souvenirs, and 14 of the aforementioned children’s books, which I also illustrated. I am currently working on another 2 children’s books for The Five Mile Press, which combine another passion of mine – drawing wildlife. I have always been an adventurer, inspired to travel (and indeed – write), from an early age by my great great uncle – Sir Rider Haggard – who wrote over 68 books, most of them swashbuckling adventure novels set in exotic locations, predominantly Africa. These included King Solomon’s Mines, Nada the Lily, and She, the latter of which sold 83 million copies in 44 different languages, and is one of the best selling books of all time. 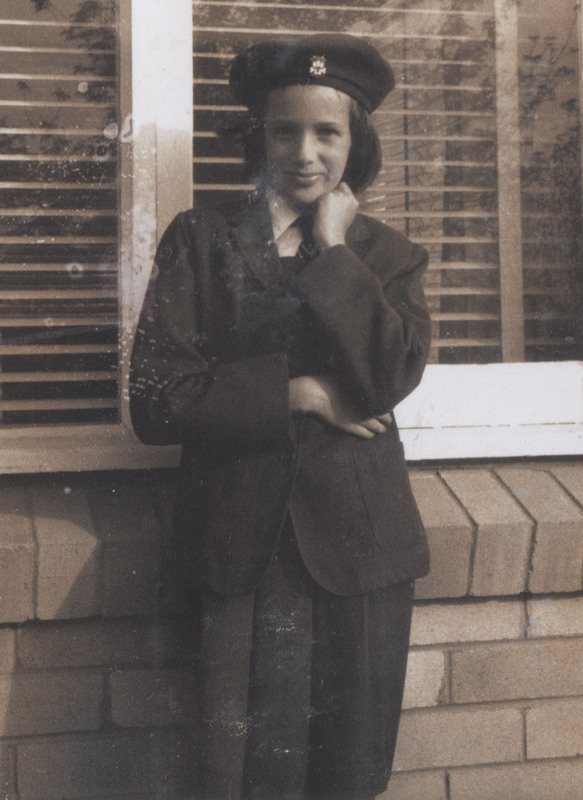 With such rich genealogy, I would lie in bed at night dreaming that one day I too would be dashing about the world in a safari suit – albeit perhaps a little Armani number. However my first foray into the unknown was cut short. 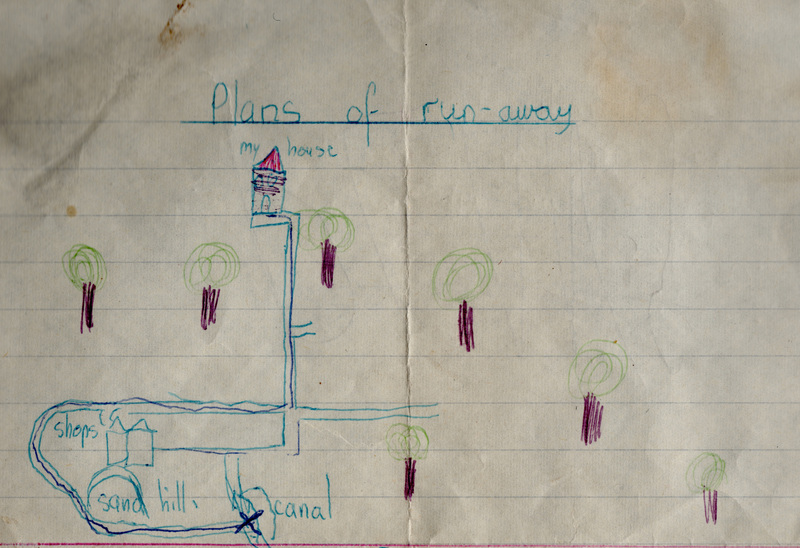 At 9 years old I was going to run away (see exceptionally well researched map below). But it was raining that day. So instead I ran away to the spare bedroom. Well, for three hours. When it was clear that no-one had noticed I’d ‘left home’, I decided it was time for afternoon tea, and running away could wait for another day. 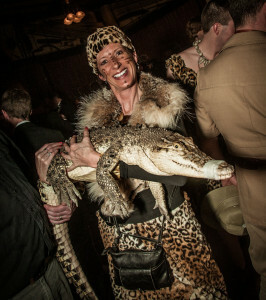 And anyway – look at this photo taken that same year – I’m hardly dressed for getting down and dirty on the savannah. 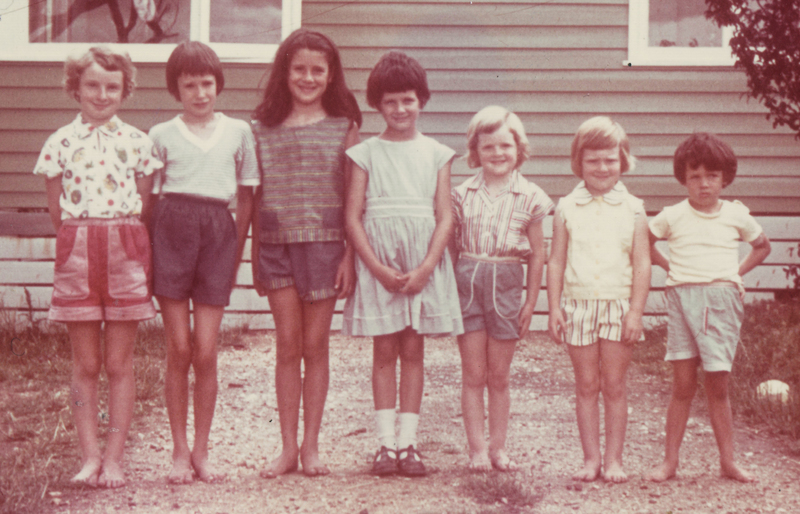 When I’d grown up a bit, I started travelling in earnest, and haven’t stopped since. Singapore. Hawaii, France. Germany. Italy. Spain. Greece. Turkey. England. Wales. Austria. Holland. Thailand. New Zealand. New Guinea. Fiji. Vanuatu. New Caledonia. Indonesia. Bali. Lombok. Borneo. Kenya. Botswana. Zambia. Zimbabwe. Morocco. Tunisia. Hong Kong. Japan. 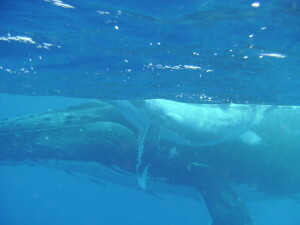 Tonga. Not to mention another 9 extra countries I visited as part of my book Men on the Menu. Portugal. Ireland. Scotland. Hungary. Monaco. Liechtenstein. Denmark. Oman. United Arab Emirates. Such trips were full of adventure, and most never failed to offer exciting opportunities for getting up close and personal with the local wildlife – my bottom being nipped by a grumpy camel in Tunisia, chased by a baby elephant in Kenya, having my lower leg mistaken for a bush rat and torn to shreds by a totally demented feral cat in Mombasa. Thank God for the rabies shot. And just as well too, that the local men I encountered during my Men on the Menu foray, were a little less agitated than the wildlife. These days, when I’m really pining for exotic adventures but can’t get away, I simply hang out at eccentric parties (below). I think this is much nicer than a safari suit. 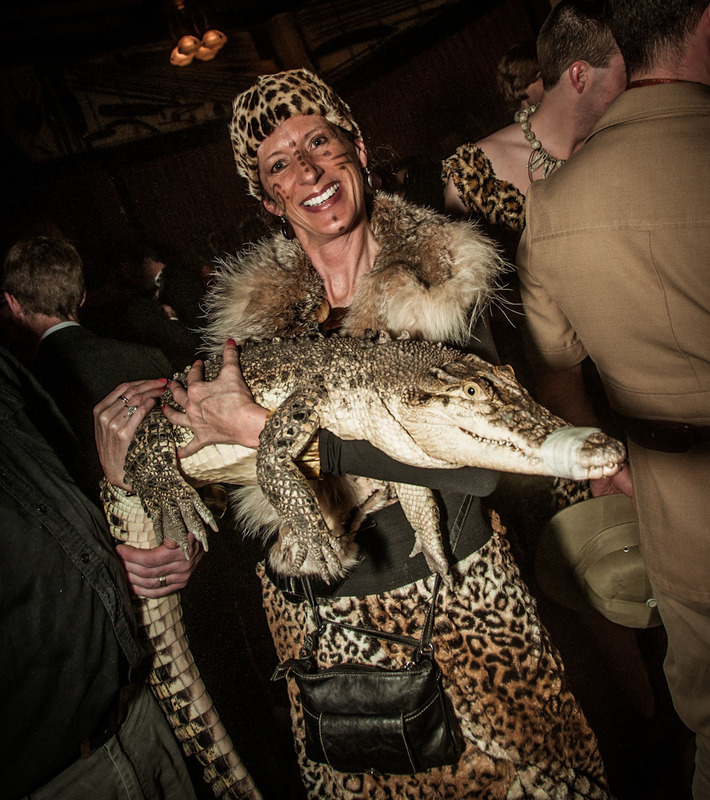 And I’d prefer a live croc over a crocodile handbag any day of the week. And travel in the future? I’m planning to visit the gorillas in Uganda or Rwanda in the next year or so. It’s very high on my bucket list, along with working in a wildlife orphanage in Thailand. 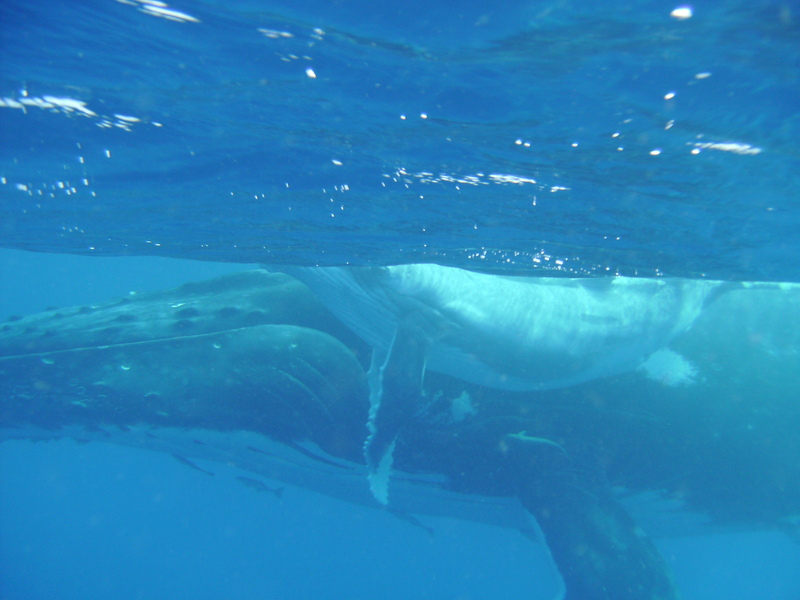 Or return to swim with humpback whales in Tonga – undoubtedly the most amazing experience of my life to date. And I’ve had many. 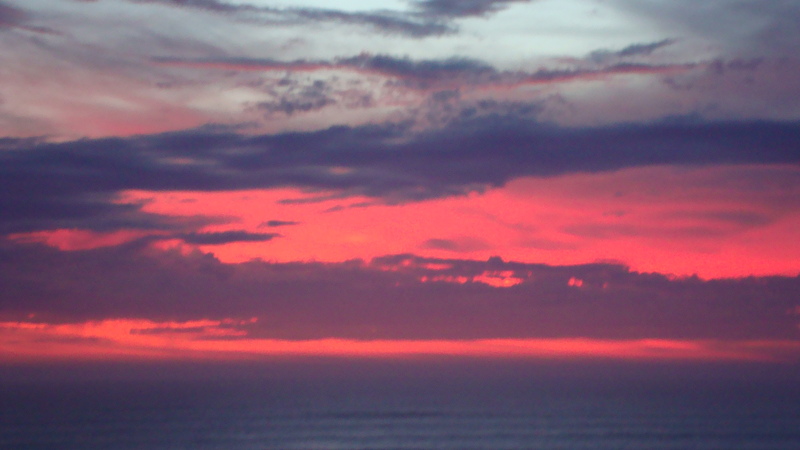 I am lucky enough to live on the coast, which is the only way I keep my sanity! Nothing like fresh air and salt on your skin to make you feel alive. I spend my time collecting sea-debris to turn into weird and wonderful sculptures, saving injured wildlife, experimenting on friends with new recipes, and trying to perfect the art of NOT falling out of the hammock after one too many wines. And with sunsets like this, why would I want to live anywhere else?! I work in town 3-4 days a week in a studio/warehouse/office, trying to come up with the next ‘big thing’, whether it be a novel/non-fiction book, children’s cartoon character for a TV series I’m working on, children’s book illustrations, or new designs for souvenirs. For the odd break I head for the funky cafes to keep myself awake, catch a film if I’m staying overnight to save the commute (including a zombie film once by mistake!) and two mornings a week I take my brother’s dog out for his daily walk and an afternoon sleepover. 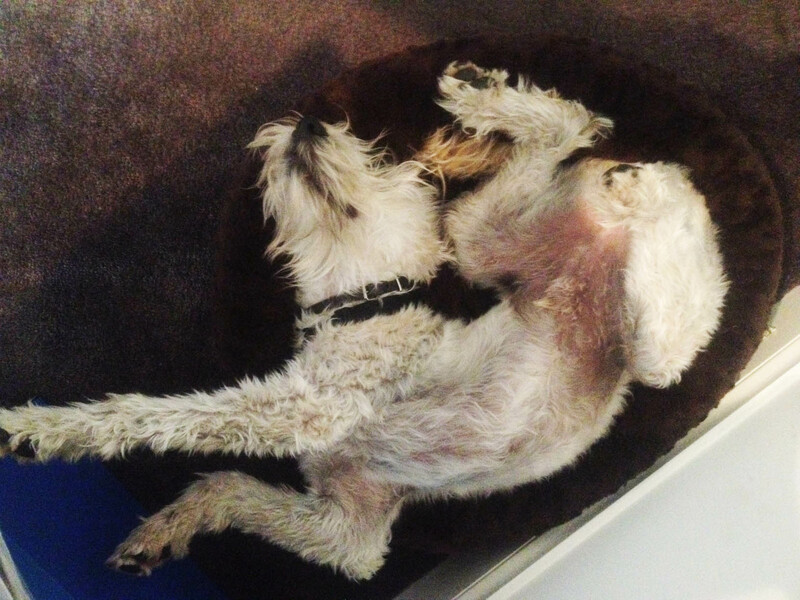 See below – and no, he’s not dead – that’s just the way he sleeps!! I currently have no husband, or children, but am thinking of adopting a three-legged greyhound. Hola! I’ve been reading your weblog for some time now and finally got the bravery to go ahead and give you a shout out from Huffman Texas! Just wanted to say keep up the excellent job!